Inspired by the popular ban.do pins, you can make one to pin on clothes, in hair or on shoes! Easy DIY accessories with a big impact. Cut hearts in various sizes out of the felt. An easy way to get a symmetrical heart is to cut a square piece of felt, fold it in half and then cut a teardrop shape out of it. 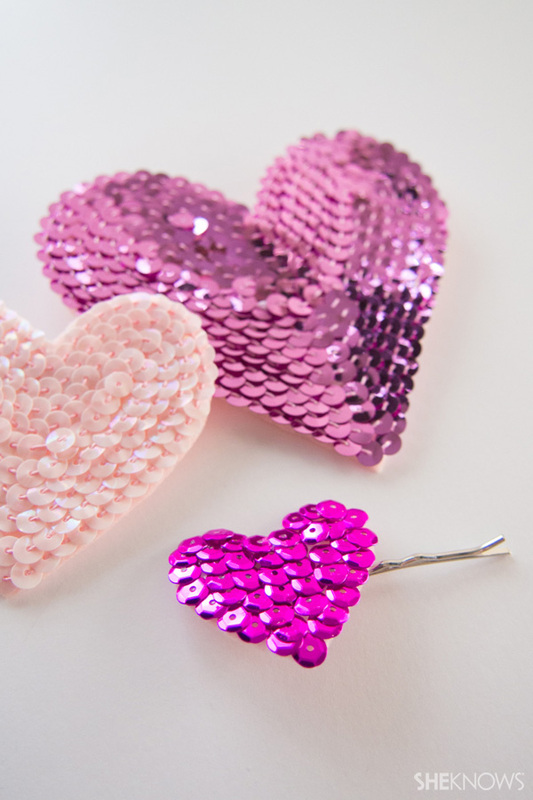 Squeeze glue around the edge of the heart, and then start laying the strand of sequins on it. After you complete the first outline, squeeze more glue around the inside of that and lay another row of sequins inside the first row. Continue doing this until the entire heart is full. For the smaller hearts, you can use this method or you can try adding individual sequins by hand, depending on the look you want. Fill the heart with glue and then work your way from bottom to top layering sequins in rows, overlapping a bit. Let the hearts dry and then add the bobby pin or regular pin backing. Squeeze some E-6000 glue onto the metal piece and press on to the back of the heart. Let dry and then wear! You can also give these out to girlfriends as gifts. Share the love!